This is the fourth of the fortnightly Run with an Idea blogging debates and I think this subject should generate a lot of debate! Like a lot of people I learned to run using the Couch to 5K approach. Run for a bit, walk for a bit, gradually increasing the time that you run and decreasing the time that you spend walking. It’s a tried and tested method. When I entered my first 5K race in June 2011 my one and only aim was to run the entire way. No walk breaks. No stopping. That, I thought, would make me a real runner. And I did it. In a painfully slow 38 minutes. By the end I was shuffling rather than running, but I hadn’t stopped to walk at all. I was proud, I was a real runner. Then my sights turned to a longer distance and I signed up for the 10 mile Great South Run the same year. I increased my distance week by week, determined that I would run the entire race. Each week it got harder and harder. The last couple of miles got slower and slower until I eventually felt like I was moving at a snail’s pace. But I was still running and that was the main thing. So when I lined up with team Thinking Slimmer at the start of the Great South Run I was shocked to find one of the team suggesting that we run/walk the race. She was an experienced runner with several half and full marathons under her belt. All finished in decent times as well. She was a real runner and here she was advocating walk breaks? I was confused. But I was in a team and the rest of the team were up for it, so I went along with it as well. We decided to adopt a 9:1 ratio of running to walking. Run for 9 minutes and then take a 1 minute walking break. At first it felt odd, it broke my stride and I didn’t really like it. But then something unexpected happened. Physically I felt stronger than I had done in any of my training runs. It seemed that the one minute walking periods were allowing my legs to recover. I was running faster than I ever had done in training. Mentally it also really helped. We’d broken the distance down into small manageable chunks. Practically I also found it far easier to take on water and gels during a walk break. As I crossed the finish line in a time much faster than my training had indicated I was capable of, I was a run/walk convert. I decided that I would take this approach into my training for the London Marathon 2012. And that’s exactly what I did. I stuck with the 9:1 ratio of running:walking for the first few miles and adjusted this to 8:2 later in the race. As it was I ended up walking the last 10 mile of the race due to my running buddy picking up an injury. But I know full well that I could have kept up the run:walk regime all the way through the race. After finishing the marathon I decided that I needed to go back and teach myself to run properly, without walking. I spent most of the summer of 2012 building up my non stop running from 5K to 10K. I noticed as I did this that my pace started to decrease. This seemed odd. How could it be that I was quicker by taking walk breaks? It was then that I came across Jeff Galloway and his run/walk/run method. Having read his book I was re-converted to the walk break method. I knew that it made me run faster over all, allowed me to cover longer distances than running more stop and helped me to recover quicker. So why on earth struggle to keep running non stop more slowly? Most of us don’t run to win races. We run to take part. We’re not in it to compete against anyone other than ourselves. So if I can get to the finish line more quickly and more comfortably by taking walk breaks then why would anyone else care? I decided to go back to the walk/run method for my training for the Great South Run 2012. Following some advice in Galloway’s book I adjusted my run:walk ratio for my training to 5:1. Despite my initial reservations that this would make me slower, the absolute opposite was true. More frequent walk breaks helped me to keep running faster for longer. I took 6 minutes off my PB in that race and was delighted. But having achieved a new 10 mile PB, there was something niggling at me. I still didn’t feel like a real runner. Real runners can sustain their pace over 10, 13.1, 26.2 miles can’t they? Real runners don’t walk. But then the other side of my head argued back. 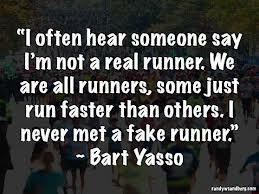 Of course you’re a real runner. You’re still out there covering the same distance as everyone else. Loads of people stop or walk through water stations in races, achieve great times and no-one questions whether or not they are real runners. When Paula Radcliffe stopped for a wee during the London Marathon, did anyone suggest that she hadn’t ‘run’ the whole race? So I’ve made my peace. I am never going to ‘race’ a race against anyone other than myself. For me it’s about the achievement of taking part, finishing and ideally getting a PB. So if walk breaks are part of my strategy to make that happen then who cares? I am Becca and I am a real runner who takes walk breaks as they make me a stronger, better runner. Well it’s an interesting one. Like you the marathon changed my approach to running. I tried the run walk approach and it really doesn’t work for me. This is not down to some philosophical idea that it stopped me being a runner. This is because in my head, walking means I’ve given up. It means I can’t physically run any more. And that is not a message to be sending myself every 10 minutes. It made starting running again after a walk almost impossible. I run whatever, even if it’s a plod. But then I don’t care about times either. Neither do I like running in company. My image of what a runner is? Well that’s different. A runner is someone who runs distance. A runner is someone who *runs* those distances. Not walk/run. Not jog. Proper running. I guess it all depends on why you run at the end of the day as to whether it matters or not. I suspect if you run competitively then run/walk is not going to cut it! So in your own mind Dawn are you a runner? You run regularly I know but from your description it sounds to me like you perhaps wouldn’t call yourself a proper runner? See to me you’re a runner. I don’t think that there’s a certain speed you have to go, or distance that you have to cover before you earn that badge. You run, therefore you are a runner! being able to be OK with walking is the oddest concept to wrap my head around as I am transitioning into ultra-running. but I am getting there. “Kata, we walk ALL the uphills” I was told. you what? I thought ultra meant that you were just this badass machine who eats marathons for breakfast. Another debate closely related to this is of speed, I think. When I originally started running (whilst heavily overweight) I clocked whopping 14 minute miles and I was told by many “real runners” that “real runners” only run single digit miles. a mile is a mile. and if 14 minutes was your best effort at the time then kudos to you. plus, you need to do what works for you. A mile is a mile, so true. I think a lot of ‘real runners’ have no idea what it takes for those of us who started off overweight to get out there and get moving. Some of my first miles were at least as slow as yours. Massive respect for moving up to ultra – I didn’t realise that so many people used walking to help them cover those crazy distances, but it makes a lot of sense. Conserve your energy on the uphills and run free on the down! What are you training for? agreed. people have no idea how intimidating those first miles are. and back then I certainly made myself believe that I wasn’t a real runner and I had no business of registering for races and basically just hid my body in all black gear wishing that I could be invisible on the streets. you are actually considered a rocky if you attempt to run ultras all the way through. even those guys who end up winning Western States (possibly one of the hardest 100 miler in the US) are walking a considerable amount of the race. you need to protect your legs for those distances. I’m running the royal parks 50K in October and then (hopefully) London to Brighton next year. PS: all the best with all your training! Clean eating will get you to the best place, I promise you! PS2: I really enjoy reading your posts but I am mostly just a shadow reader. Your experience sounds a lot like mine. Head to toe in black – please don’t look at me I’m just trying to get fit. Sounds like we’ve both come a long way from those days! The Royal Parks Ultra is supposed to be an amazing race. I know someone that did it last year. Really good luck with that. I had hoped to get a place for the half marathon but didn’t get one in the ballot. Maybe next year. I am loving the clean eating and I feel so much better for it. Wish I’d discovered it years ago. And thanks for coming out of the shadows to comment on this post! Run/walk is the best way to learn to run, and to improve your times. It’s the original version of threshold training. Hal Higdon advocates walking during refreshment stops, allowing easier intake of water/gels/food and allowing you to kick on. Considering your walking pace is about half your running pace, a 1 minute walk is only a 30 second loss on the clock. If you’re not shooting for a Paula Radcliffe time, who cares if you’re adding a few minutes over 4 or 5 hours if it gets you across the line in better spirits and better shape. I personally don’t do run/walk races, but I also do speed work in training, which is effectively run/walk training, to train me to get me through the distance in races without walking. Thinking of it as interval training puts a totally different perspective on it doesn’t it? Everyone knows that intervals are good for you! I absolutely love that quote about lapping everyone on the couch. I’m not naturally fast, nor will I ever be but run/walking is most certainly better than sitting doing nothing! Some great comments! I’m at present taking my “running” back to basics – walk breaks happen when my lungs have had enough & I need to use my inhaler or my calf muscles are screaming with cramp & I need to stretch. I’ve got used to drinking & gels ‘on the run’. This debate as surprised me how few have commented that real runners don’t walk, I thought I’d be the only one walking! I’m surprised too Lesley – but also quite heartened. It seems that most of us runners just want to encourage each other to be out there doing something good for ourselves. As long as we’re not getting in each others way during races then what does it actually matter whether someone runs the whole way or walks sometimes? I’m quite surprised at the responses I’ve got. And at the number of other people out there who are taking walk breaks now and again to help them finish stronger. I think it says a lot about the running community in general though. It’s about supporting our fellow runners in their quest to do something good for themselves. Not telling them that they’re not doing it ‘properly’ if they need to take a walk break. I agree with you, while it has been my goal for races to not walk at all, there have been some where I do a run/walk ratio like you mentioned(9:1, etc). For longer distances I find that I do better taking a walk break every now and then to recover a bit and can then run stronger through the rest of the race to avoid that “shuffle” run at the end (which isn’t so cool to cross the finish line barely being able to move). So no, I think a Real Runner can also walk. Yay – me too. I figure that if I know I’m going to have to walk somewhere in the race then I may as well make it part of my race strategy. I am so much stronger when I do. And the times when I’ve done it I’ve had something left for a sprint finish – which I agree is much better than the shuffle finish!! I think you sum this up really well when you say you’ve made your peace with the walking. One of the reasons this is such an emotive subject is that we runners often judge ourselves more harshly than we judge others. Do I think you’re a runner because you run-walk? Definitely, I think your story is a real inspiration. Do I think the guy that I passed on my run this morning was a runner, even though he was walking? Hell yes, he looked liked he’d really pushed himself and just needed a couple of minutes – he got the big grin and wave reserved for runners that I pass when I’m out. Do I think I’m a runner if I want to take a walking break? Ooh, I don’t know about that one… When judging myself I’m definitely more in Carrie’s camp (http://carrieonrunning.com/2013/08/24/run-with-an-idea-4-do-real-runners-walk/). I know that I’m capable of pushing myself harder than that and I’m forever beating myself up about stupid things like speed and walking breaks. I think of a runner as someone who looks to push their limits, stretch themselves and make improvements to their performance. How people do that is up to them. But I’ll always be my harshest critic! Thanks for a lovely comment Ems. I absolutely LOVE your definition of a runner. And you’re right – it’s a very personal thing, I spent a long time beating myself up about the walk breaks, about it being cheating etc etc but once I’d made my peace they are now part of my plan and my running has gone from strength to strength. Do I wish I could do without them? Of course I do. But I’d much rather take them when I need to, keep seeing improvements in my times and performance and keep myself motivated than continue to beat myself up after every run when I have to stop to walk. It’s a personal thing for sure, but I reckon you should give yourself a break – you sound like a real runner to me! Although I’m fairly comfortable with runs up to 10k without walking (and probably wouldn’t improve times if I did), I’ve got to admit that I’ve always struggled when stepping up to further distances. I may have felt a sense of accomplishment in completing those half marathons, but I have felt a slight failure at not being able to run the whole thing. In fact this sense of failure has dented my confidence in running another half marathon and ultimately achieve a lifelong dream of a marathon. Similarly, the embarrasment of being caught walking has limited my running outside of the gym to the odd event that I enter. Your post has made me realise that maybe I need to come to terms with the idea of walking as part of achieving my ‘running’ goals. Hmm, it may take me a while to get my head around that and apply it going forward. Thanks for your comment Peter. I can identify with that sense of failure for sure, and it does take a while to make peace with the walking but once I did I found my performance, both in terms of distance and speed improved and I enjoyed my running more. GIve it a try – treat it as part of your plan for the run – not a failure but a strategy and see you how find it. I’d love to know. I’ve always thought I might enjoy trail running. It seems in the main less competitive than road running and more about the experience than the time. Not sure how I feel about scrambling as part of a run, but the rest of it definitely appeals. And I totally agree that the most important thing is being out there, getting fit. Who cares if that involves a bit of walking?